Clear Capital leads the nation in providing residential and commercial real estate valuations, data and analytics, quality assurance services and technology solutions. They were favoring Oracle solutions for their data surpluses, but wanted to keep costs down when scaling in the future. 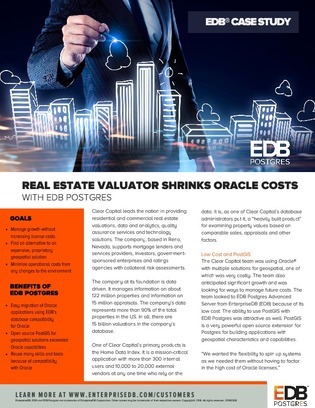 “We wanted the flexibility to spin up systems as we needed them without having to factor in the high cost of Oracle licenses,” said Terry Schmitt, Data Systems Engineer at Clear Capital. Read this case study to learn how they solved this budgeting and scalability problem.